Wise advice: Cardinal Edwin O’Brien meets seminarians and staff members during a visit to the Holy Spirit Seminary on September 17. 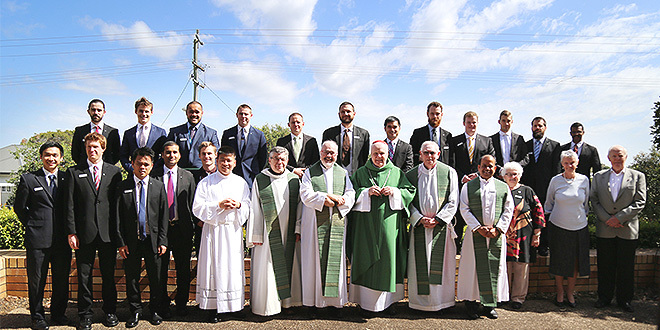 THE Grand Master of the Equestrian Order of the Holy Sepulchre of Jerusalem has made a visit to Brisbane, encouraging seminarians in their priestly vocation as he visited the Holy Spirit Seminary. 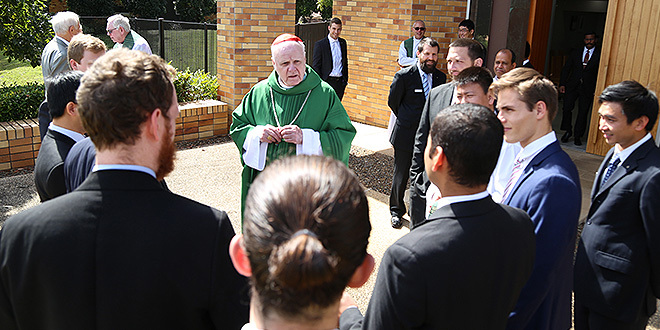 In Brisbane, United States Cardinal Edwin O’Brien was also preparing to invest three new members into the order, including Townsville Bishop Tim Harris, John Whelan and Therese Gattas. During his visit to the seminary, Cardinal O’Brien celebrated morning Mass with seminarians and toured the premises. Asked about news reports that the National Council of Priests would push for optional celibacy and married priests in its submission to the Plenary Council 2020, Cardinal O’Brien said: “I don’t think we are ready for that”. “I think there’s more generosity amongst our men to step forward; I don’t think we should give up on that and don’t sell them short,” he said. Cardinal O’Brien, born in the Bronx, New York, has served as an army chaplain – during which time he learned to fly and to parachute – became Military Ordinary, and has served as a rector of seminaries in the United States and Rome, and as Archbishop of Baltimore. Pope Benedict XVI appointed Cardinal O’Brien as the Pro-Grand Master of the Equestrian Order of the Holy Sepulchre of Jerusalem in 2011. In his role, he is based in Rome and travels across the world – but said he was keeping a close eye on affairs in Rome. “There are divisions, tensions, no question. The Holy Father is trying to bring it together,” he said. The Order of the Holy Sepulchre supports the Church in the Holy Land, particularly the Latin Patriarchate of Jerusalem, through prayer and good works. It has more than 30,000 members worldwide and about 50 lieutenancies, according to Dr Paul Bartley who is the vice-governor general for Australia and the Pacific and has accompanied the grand master on his Australasian visit. “It is to encourage local members and to invest new members,” Dr Bartley, a previous lieutenant of the Order in Queensland, said. The order’s charity work is focused on supporting the Church in the Holy Land. “There are forty-seven schools in Palestine and Jordan, three in Gaza, three in Israel, two universities and many convents, retirement villages and day-care centres,” Dr Bartley said.